Here we provide the size and design requirements for aerobic septic tanks or ATUs. Here are designs and products for aerobic septic treatment units (ATUs, or in the UK, Australia, New Zealand, Aerobic Wastewater Treatment Units or AWTs) for onsite waste disposal, also called fine bubble aeration systems. We address aerobic septic system design, features, inspection, repair, and maintenance. Aerobic septic system product sources are also listed. Qualified aerobic septic tank designers, producers, or service providers may be listed at this website at no fee. 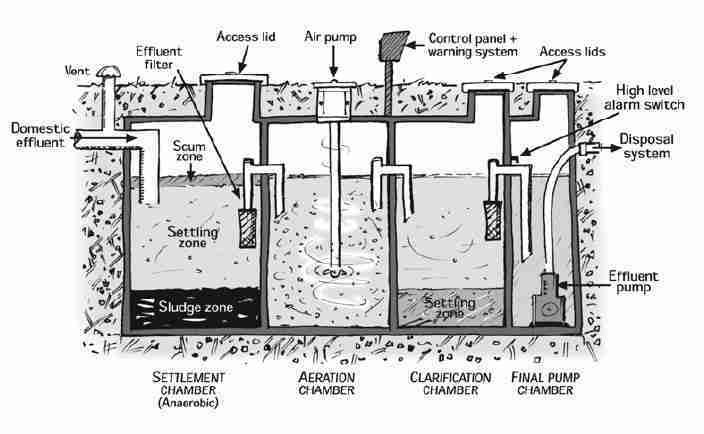 The page top illustration of a four-chamber aerobic wastewater treatment unit is adapted from the New Zealand Taranaki Regional Council's sewerage system guide. Typically a residential aerobic septic treatment unit does not run continuously, just as inflow to it is not continuous. ATU size or capacity is determined as for a conventional septic system, by allowing 50 to 100 gallons of wastewater per day per building occupant. Some jurisdictions require that the system minimum capacity accept 500 gallons of wastewater daily. A "safe" design size for an aerobic treatment tank that allows for temporary power outage (and thus loss of the aeration pump) is an aerobic treatment tank at least as large as the conventional tank that would have been required for a given site. Two basic ATU designs provide for intermittent or continuous flow through the system. Just as most residential septic systems do not receive wastewater continuously but rather intermittently, the ATU may be designed to turn the aerator and agitator on and off as needed. Intermittent flow septic systems, including aerobic or aeration treatment designs are also called a "batch system" septic design approach. Other aerobic or aeration septic treatment systems, particularly aerobic systems which have to serve a larger facility where wastewater inflow may be continuous, may themselves operate continuously. Obviously these designs are called "continuous flow" aerobic treatment systems. Question: How do I size the correct aerator pump for my ATU ? How do I size the correct aerator pump for my ATU ? My systems holds 600 gallons . There are 5 people in our house , with vistors sometimes 10 ? Do I need a dual pump or can I run pumps alternately ? In very general terms, the ATU size or capacity is determined as for a conventional septic system, by allowing 50 to 100 gallons of wastewater per day per building occupant. Indeed a number of aerobic septic designers suggest dual aerator pumps that are run alternately to be sure that both are operational. That design helps assure that the ATU can keep operating even if one of the pumps fails and thus needs repair or replacement. Please see detail on aerobic pump sizing at AEROBIC SEPTIC AERATOR PUMPS - next in this article series. Continue reading at AEROBIC SEPTIC AERATOR PUMPS or select a topic from closely-related articles below, or see our complete INDEX to RELATED ARTICLES below. AEROBIC ATU SEPTIC TANK SIZES at InspectApedia.com - online encyclopedia of building & environmental inspection, testing, diagnosis, repair, & problem prevention advice.